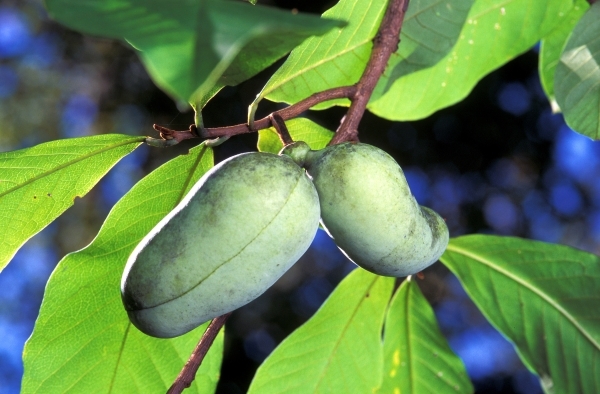 The pawpaw is the only temperate member of the tropical Annonaceae family. 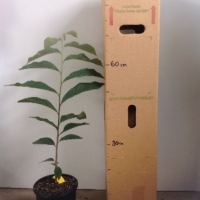 It is a small, deciduous tree that may attain 5 to 10 m in height. In the forest understory, trees often exist in clumps or thickets. This may result from root suckering or seedlings developing from fruits that dropped to the ground from an original seedling tree. In sunny locations, trees typically assume a pyramidal habit, straight trunk and lush, dark green, long, drooping leaves that turn gold and brown in colour during the fall. Flowers emerge before leaves in mid spring. The blossoms occur singly on previous year's wood and may reach up to 5 cm in diameter. Flowers are strongly protogynous, self-incompatible and require cross pollination although some trees may be self-compatible it is a good idea to plant two or more trees for cross pollination. Fruits are typically 3 to 15 cm long, 3 to 10 cm wide and weigh from 200 to 400 g. They may be borne singly or in clusters which resemble the "hands" of a banana plant (Musa spp.). This highly aromatic, climacteric fruit has a ripe taste that resembles a creamy mixture of banana, mango, and pineapple. Shelf-life of a tree-ripened fruit stored at room temperature is 2 to 3 days. With refrigeration, fruit can be held up to 3 weeks while maintaining good eating quality. 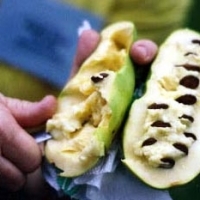 Within the fruit, there are two rows of large, brown, bean shaped, laterally compressed seeds that may be up to 3 cm long. 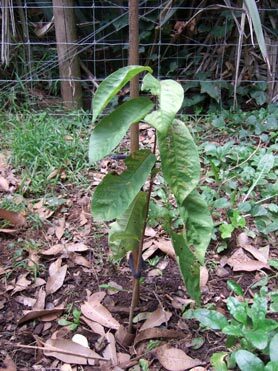 Asimina triloba - Sunflower, Prima - Self Fertile with high quality fruit! Have 4 trees that have been fruiting for the past 3 years including two grafted types. Also growing the self fertile varieties Sunflower and Prima which are most popular in Europe. Found that Pennsylvania Gold has exceedingly large fruit but a very bad after taste and therefore not worth growing in my opinion. 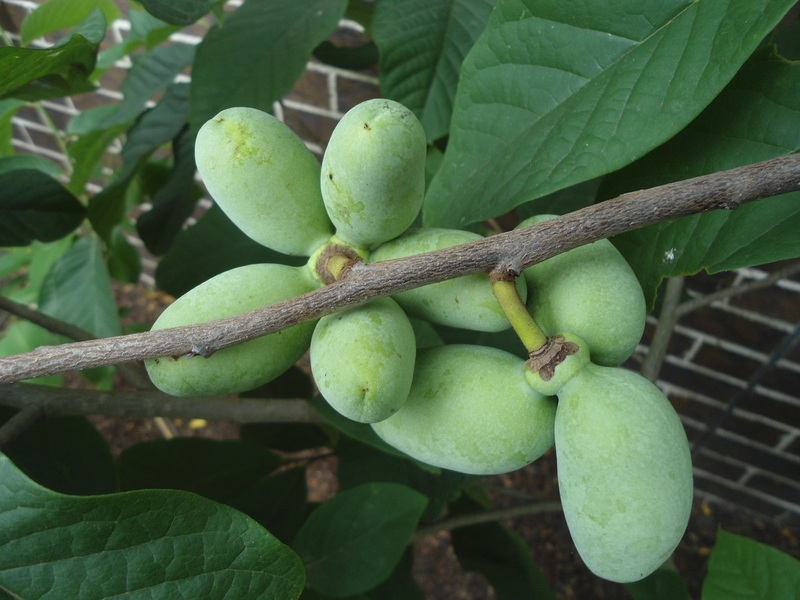 The 'Louis' or 'Melbourne' variety is better with good size fruit but still has a little of the poor after taste. My seedling trees have sensational flavour, much better than the named varieties, but alas they have more seeds and poor flesh to seed ratio. Now pinning my hopes on Prima and Sunflower varieties for having optimum fruit but they are yet to reach fruiting age. 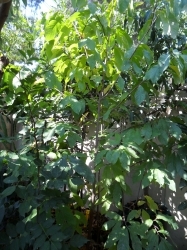 All are very hardy trees, can take dryness but perform better with some shade in Summer. Linton, when do yours break dormancy? My trees (seedlings) stayed dormant all through summer. They still seem to be alive but no leaves at all. My trees broke dormancy at the end of Winter and are now in flower. Never heard of them being dormant or leafless over Summer. Only have small plants available at the moment. Will have seeds from the current crop once they are ripe in a few weeks time. Hello, I have some seedlings of prima in the Adelaide hills. They are only a few inches high even though they were potted up early this summer. If you have some seeds give them plenty of time to sprout. They take they're time. 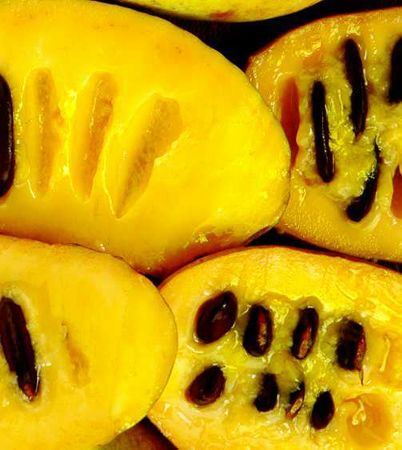 Comments: - North American Paw Paw is a member of the annonaceae family (custard apple) which include cherimoya, atemoya, rollinia, A. squamosa, soursop (graviola), soncoya etc which most of them have superb taste. 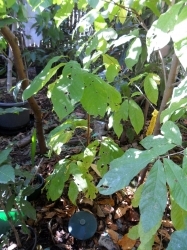 Unlike the other members of annonaceae family asimina triloba can survive freezing conditions up to -25C when dormant especially the Canadian selection NC1. So gardeners from the temperate regions of Australia from Tasmania, Victoria to Canberra and some parts of inland NSW if you are after a tropical fruit flavour (taste like mango and banana combined) but situated in a frosty area this is the fruit for you. Most asiminas need a pollinator to set fruit. But there are some American and Italian varieties that are purportedly self fertile (Prima - Italian, Sunflower and Sweet Virginia - both are American selections). Unfortunately most asiminas in Australia are the self infertile variety. Seed importation is a prerogative for those seeking the self fertile cultivars. wow, I didn't know we could get any known cultivators here in Australia. 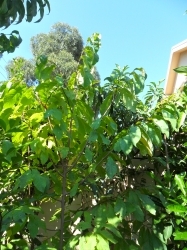 I am near albury/Wodonga and have 4 asimina's growing, all about 1.5-2m tall. they had set fruit this year (with the help of hand pollination) but the wind and the birds got to them. 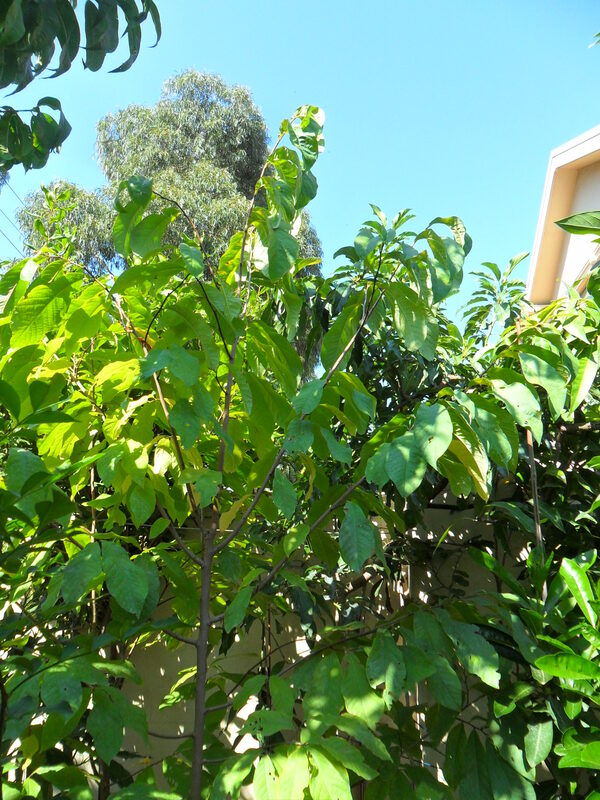 I will protect trees better next year, and hope to get some good fruit! dont stand up to the wind too well, set frui tlast year with hand polination, but wind and birds got to the fruit. I have a seedling of Asimina Triloba, but I am still looking for a named variety of good eating, preferrably a cultivar rather than seedling to go in hopefully with a bit of luck - my future Paw Paw Patch. 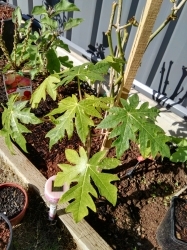 Comments: - This is a Daleys seedling at the front and 2 seedlings from another source behind - its about 3,5mt now and has flower buds forming for fruit next spring 2019. 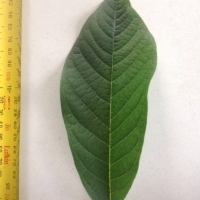 Smaller Asimina is a Grafted Pennsylvania Gold planted in 2017. Question: I would like to know where this seed was sourced and if its from a Premium selection like Overleese - Prima or Sunflower - the last 2 that are known to be self fertile types. I feel that its a native indiana tree that more people should see in abundance.